White House press secretary Sarah Sanders wouldn’t say Monday whether President Donald Trump actually believes Democrats hate Jews, as he is purported to have told GOP donors, according to an Axios report. 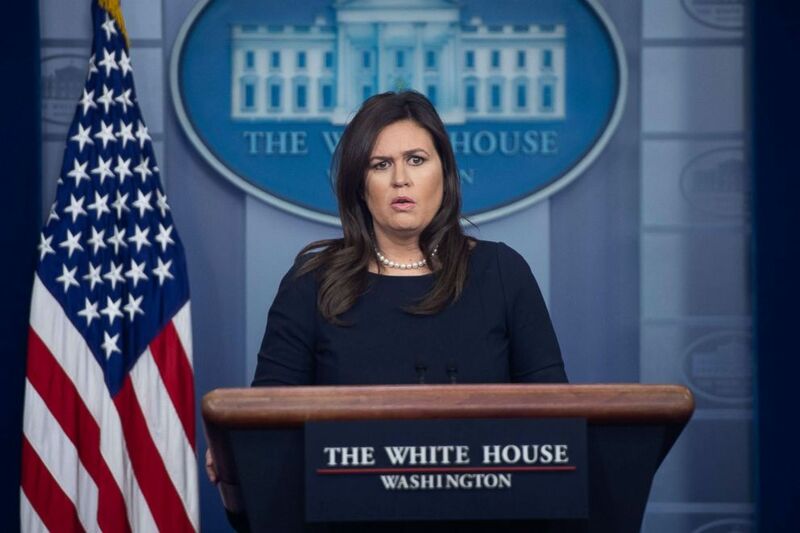 “Does the president really believe Democrats hate Jews?” ABC News’ Chief White House Correspondent Jonathan Karl asked Sanders at the first briefing she's held in more than a month. Sanders dodged the question and instead slammed Democrats for not putting out a stronger resolution condemning anti-Semitism. Last week, House Democrats passed a resolution that broadly condemned hate, including anti-Semitism and Islamophobia, after a freshman Democrat, Rep. Ilhan Omar, a Muslim, made comments criticized as anti-Israel. Omar was not singled out by name. “The president's been an unwavering and committed ally to Israel and the Jewish people. Frankly, the remarks that have been made by a number of Democrats and fail to be called out by Democratic leadership is, frankly, abhorrent and sad and it's something that should be called by name. It shouldn't be put in a watered-down resolution,” she responded. On Friday, the day after the House vote, Trump said Democrats have become an "anti-Israel" and "anti-Jewish" party. On Monday, when another reporter followed up reiterating Karl's original question, Sanders declined to comment on whether the president actually accused Democrats of hating Jews. “I am not going to comment on a potentially leaked audio tape,” Sanders said, going on to accuse Democrats of not being more forceful in condemning anti-Semitic comments. "Democrats have had a number of opportunities to condemn specific comments and have refused to do that," Sanders said. Pressed yet again in the briefing on whether the White House holds a view that Democrats hate Jews, Sanders responded, "That's a question you should ask the Democrats." While Sanders claims Democrats on the Hill are inadequately supportive of the Jewish community, a disproportionate number of members of Congress who are Jewish are also Democrats. According to a Pew analysis of the current congressional class, only two Republican members of the House are Jewish, while more than half of Democrats’ non-Christian members are Jewish. Questioned more broadly about the tone of the rhetoric, and whether the president intends to dial down his rhetoric in his upcoming 2020 reelection battle, Sanders pivoted to slam Democrats and make a wild and untrue claim that the opposing party supports killing babies. “I think that the real shame in all of this is that Democrats are perfectly capable of coming together and agreeing on the facts. They're comfortable killing a baby after birth, but they have a hard time condemning the type of comments from Congresswoman Omar. I think that is a great shame,” Sanders said. Karl also questioned why the president has not directly condemned Republican Rep. Steve King, who has questioned what’s wrong with terms like white supremacy. “I have talked about that a number of times and I’d refer you back to those comments where I used words like abhorrent and unacceptable,” Sanders simply said. But while Sanders has denounced King’s comments as “abhorrent,” the president has not done so.